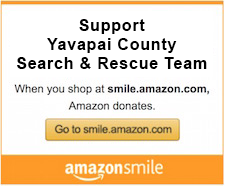 The Yavapai County Search and Rescue Team (YCSRT) Quad Unit is dedicated to serving visitors and residents of Yavapai County "so others may live." Under the direction of the Sheriff's Department, certified and trained volunteers utilize off-road quads and side-by-side vehicles to search for, rescue and/or recover missing persons, assist with evacuations and roadblocks during fires and floods, conduct evidence searches at large area crime scenes, perform back-country safety patrols and other duties as assigned. Yavapai County has hundreds of miles of trails that are generally inaccessible to traditional full-size four-wheel drive vehicles. We use our machines to search rough and rocky terrain, often on narrow two-track back-country roads, day and night, in all weather conditions. The Quad Unit welcomes individuals who are interested in participating in these activities. Due to the nature of our organization and mission, there is an application process that all interested parties must complete. Posted below, you will find the basic requirements for the Quad Unit that must be met before membership and during a probationary evaluation period. Additionally, consideration must be given to time and financial commitments you make for training and equipment necessary to safely carry out the missions described above. This can be a highly demanding but equally rewarding opportunity to serve your community and we look forward to discussing your interests with you. For general information about the application process, please contact the Quad Unit Manager at quadmanager@ycsrt.org. * Ability to be a team player (evaluation ongoing). * Willingness to take direction (evaluation ongoing). * Willingness to accept constructive criticism (evaluation ongoing). * Applicant must be physically capable of driving their quad or SxS in rough terrain, at night, in extreme conditions and staying in the field for up to 24 hours. * Applicant must be capable of completing a two mile walk in one hour wearing a 25 pound pack. * Possess an email account with ability to open and send emails, open attachments and attach files. * Possess a GPS unit suitable for wilderness navigation. After Sheriff’s Department Approval and Applicant Phase Qualifications are met, Applicant should receive YCSRT ID card and ID number. Probation begins and individual may participate in field training. * Must be able to navigate using GPS, and map and compass including downloading and/or email track to Incident Command and Training officer. * Must be capable of riding safely in all terrain and weather. * Must possess and be able to use all mandatory equipment. * Must possess functioning radio (loan is ok) and be competent in communications. * Must be familiar with and willing to follow policies and procedures of YCSRT, Quad unit, and Sheriff's Department where applicable. * Must attend at least 6 Quad Unit monthly meetings and 50% of Quad Unit field training exercises in a 12 month period. * During probation, members may or may not be called out to searches at the discretion of the Unit Manager or his/her designee. ALL YCSRT members deployed in the field must eventually attain Arizona Search and Rescue Coordinator's Association (ASARCA) III certification. Contact the Quad Manager or Training Coordinator for more details. * Must have the skills, knowledge, abilities, mental and physical capabilities and equipment to remain in the field, on your own, for 24 hours, under any conditions. This is a level of preparation and capability you want to achieve for safety's sake, however, we NEVER go out alone.